c. Follow UFT on Twitter. This, in the view of the President of the United Federation of Teachers, will somehow help to halt Andrew Cuomo's attempt to circumvent tenure and collective bargaining by placing troubled schools into receivership. This will help stop him from eliminating the charter cap. This will further, hopefully, prevent merit pay, pension deterioration, and five year renewable so-called tenure. None of that old-fashioned mobilization nonsense for us, particularly since over 80% of us can't even be bothered voting for leadership. Mulgrew pointed to the odd NY State legislative laws, and said that if the budget is rejected Cuomo would have enormous power to enact changes via executive order. He pointed to Cuomo's planned tax refunds, which will lock in a whole lot of suburban legislators. Everyone loves getting money in the mail, and Governor Cuomo has no issue buying off whoever needs buying off. Mulgrew says we will not fight over evaluation, because then Cuomo will contend we didn't want it. This is an odd position, in my view, because there's now a movement, supported by our insane governor and private-schooled Merryl Tisch, to make state measures 40%, and to rate any teacher ineffective who doesn't meet the junk science standard. A large tenet of the Revive NYSUT campaign to overthrow leadership was that Iannuzzi had initiated the APPR law. They always seemed to forget that he did so with the express cooperation of Mike Mulgrew. The problem, of course, is that teachers really don't want a junk science evaluation system. Evidently, what teachers want is not a factor we consider during a substantive battle. 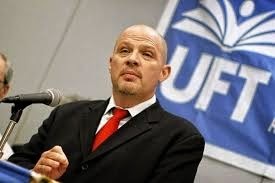 Another big idea from UFT leadership is to improve the perception of struggling schools. Such schools have large populations of ESL and special needs students. Mulgrew says if we do that, something that's never been done, we will immensely enhance our credibility. I did not hear arguments about addressing, for example, poverty. Nonetheless, given that we heard very similar arguments about UFT charter schools, and given they have not proven to be the magic promised, I'm not sure precisely what fuels the President's rampant optimism. Mulgrew says Cuomo does not wish to fight over school funding and exploding class sizes, and that this will therefore be a more promising area in which to fight. This is curious to me, since we've done absolutely nothing to improve class sizes in my entire 30-year teaching career. Every chapter leader knows the only instrument that really regulates class size is the UFT Contract. Mulgrew himself just negotiated his first contract, and while we were successful in getting us the raise most city employees got ten years late with no interest, we did absolutely nothing to improve class sizes. I'm not sure how credible we are making class size demands. Mulgrew referred to a pretty well-bandied about fact--Cuomo is angry about his pathetic margin of victory, and vindictive that we and NYSUT failed to support him. He clearly failed to appreciate our bizarre tactic of failing to oppose him. The largest threat to Andrew Cuomo would have been a serious opponent on the left, to with, Zephyr Teachout on the Working Families Party. Unions, including UFT, were adament that WFP support Cuomo, threatening to withhold support of the party altogether if it didn't. And, of course, when Teachout redirected her energies to opposing Cuomo in the Democratic primary, AFT President Randi Weingarten made robocalls for Cuomo's running mate, Kathy Hochul, after the NY Times endorsed Teachout's running mate, Tim Wu. Oh, the ingratitude of Andrew Cuomo. He even vetoed his own initiative for a temporary safety net for teachers against the results of the Common Core tests that fail 70% of our students. So was it a bad idea for us to usher in mayoral control that closed almost every comprehensive high school in the city? Should we not have supported the failed quasi-merit pay program, charter schools, Common Core, colocations, and the ATR? Will a bunch of UFT-endorsed tweets stop Cuomo from bribing the taxpayers and appeasing his multi-million dollar contributors? If we hadn't done all that, would it now be as easy for Cuomo to push his odious corporate agenda on a misinformed public? Tough to say for sure, but I've seen no evidence our go-along-with-whatever policy has helped anyone but the reformies who bought and paid for Andrew Cuomo.